Street art is gaining popularity in Turkey, with the Pera Museum even staging its first-ever graffiti and street-art exhibition last autumn. But the best place to see street art in the city is undoubtedly Kadıköy, where Istanbul’s most laidback and progressive municipality is beautifying its neighbourhood with massive, bold murals, as part of the Mural-Ist festival. 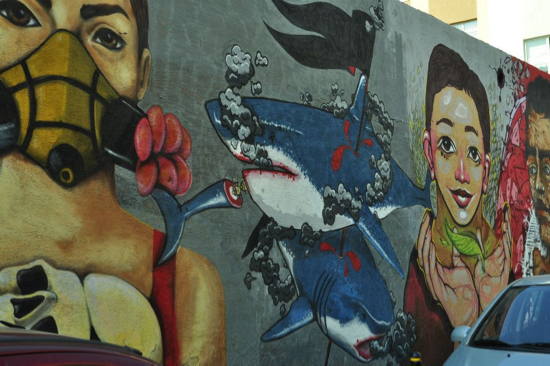 This series of street-art festivals started in 2012, continued in 2013, and is back this year. International and local street artists are invited to repaint the walls of Kadıköy, giving the neighbourhood an edgy, young feel. Artists have a week or so to paint a wall, and visitors can visit during those times to watch them at work and then take a walk around the neighbourhood to see the other murals. 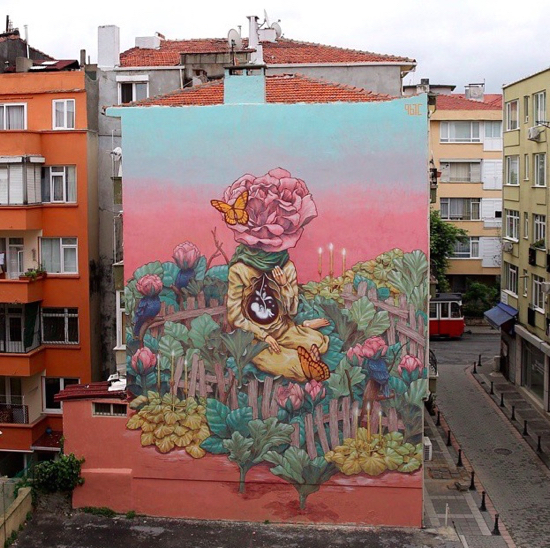 The festival started on June 12, with the Russian artist Rustam QBic painting the wall of the Emek Apartment on Ağabey Sokak. He produced a creature with a rose for a head, sitting in a garden of flowers. The artist’s use of colour is superb – he chose a pink that matches the original colour of the building and doesn’t clash with the one nearby. 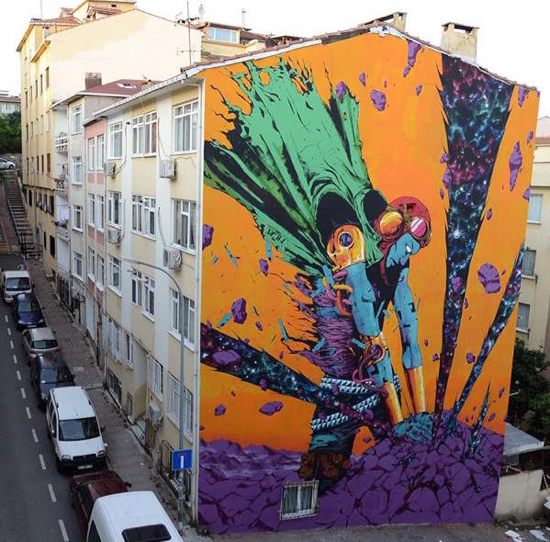 Between June 25 and 30 the Spanish artist DEIH painted No 7 on Yeni Duygu Sokak, giving the neighbourhood a new superhero. On June 27 the popular Turkish artist Cins (he’s previously painted the façade of the Tophane art space Mixer) started painting the Eren Apartment on Sarraf Ali Sokak in his signature style. He completed the mural – perhaps the most street art-y of them all – on July 4. 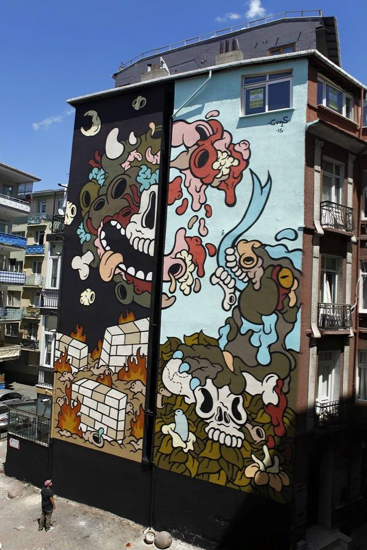 The renowned American street artist Levi Ponce and Kristy then produced a collaborative work on Buzhane, on Karakolhane Caddesi, which they completed on July 11 (main image). The artists’ styles are totally different – but somehow it works. The blue is eye-catching and this mural could equally well be on the streets of Berlin or Buenos Aires; its appeal is universal. 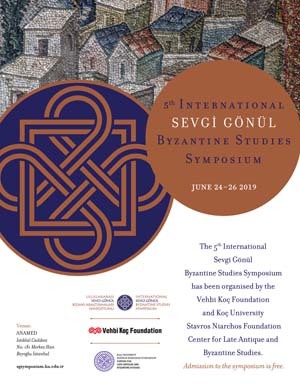 On August 17 Istanbul native Canavar starts on his piece at the Acıbadem Campus of Marmara University. You can watch him work until the 24th. Between September 2 and 9 the Barcelona-based Aryz will work on the Timur Apartment on Sarraf Ali Sokak. And rounding off the festival will be Wicx, Nuka and Esk Reyn at the Kadıköy Belediyesi on Fahrettin Kerim Gökay Caddesi between September 23 and 30. Works from previous years include a delightfully geometric tribal creature from the well-known French artist Amose, simpler and subtler than most of the other murals. You'll find it on Kırmızı Kuşak Sokak. 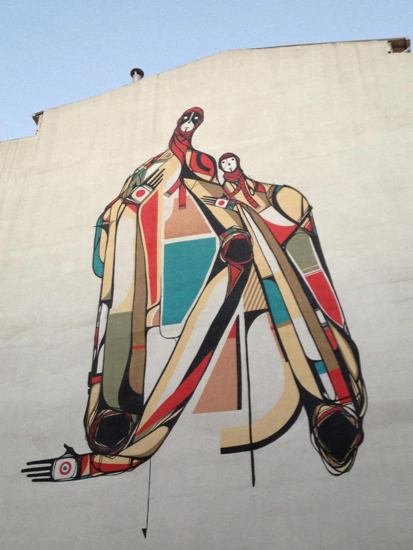 Fu, Lakormi̇s, Wi̇cx and Esk Reyn collaborated to produce the mural above on Mühendis Sarı Ali Sokak. It’s a lively melange of faces, plants and animals, with a thoroughly modern feel. 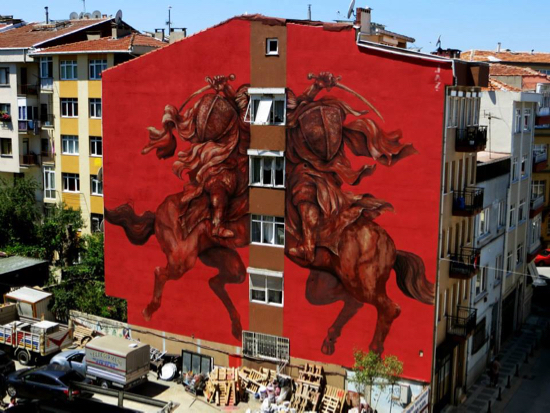 This majestic ox-blood-red mural by the pioneering Argentinian street artist Franco Fasoli (aka JAZ) on the building near the Otopark on Iskele Sokak is perhaps the most conventional in style, calling to mind an Ottoman battle. 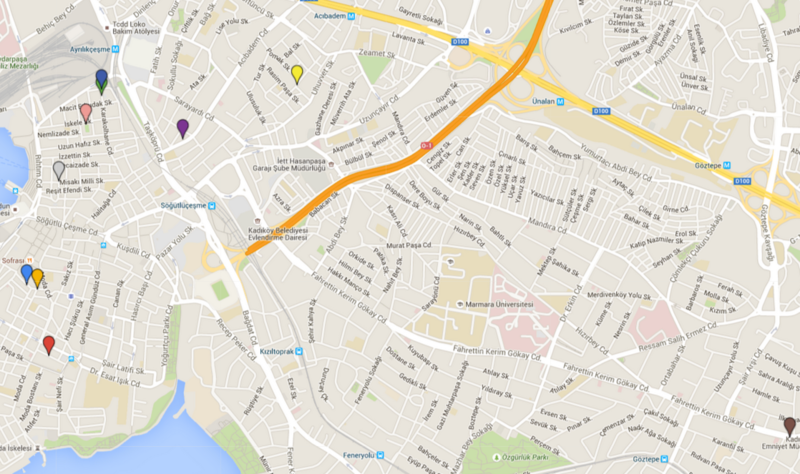 Below is a map showing the murals mentioned in this blog. Click here for the interactive version. City Bosphorus: Anatolian Side in Cornucopia 52 has more on the festival, with photographs by Monica Fritz of some murals not shown here. This is an excellent resource, showing all the murals on the Anatolian side. Our guide has the places to stop for food or a glass of something. Once you’re finished there, grab Cornucopia 51 and explore Beyoğlu to spot more murals, especially in the Galata, Karaköy and Cihangir neighbourhoods.